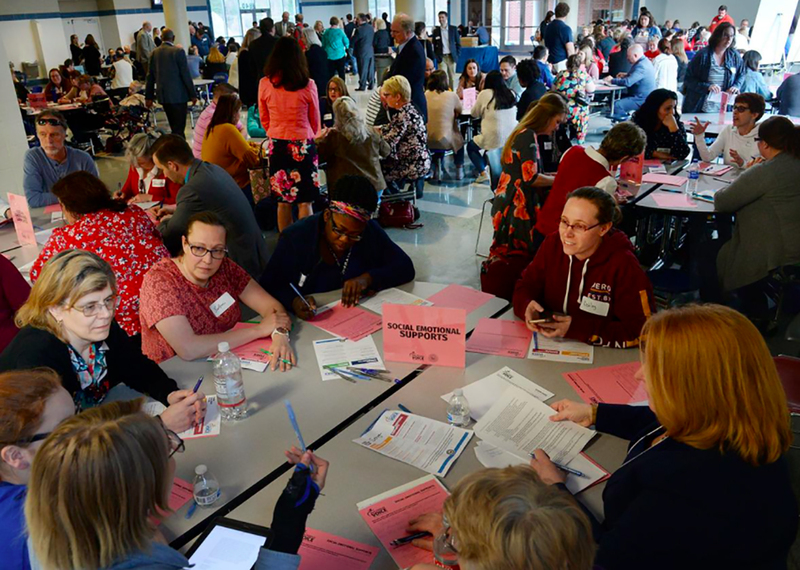 Teachers, parents, students, support personnel and other interested people participate in small group roundtable discussions on the topics of social emotional supports, school choice and innovation, instructional quality, and funding opportunities at the education forum held at Capital High School Wednesday night. CHARLESTON, W.Va. — Jackson Sorrells, a Capital High sophomore, wants more funding for the arts and for sports other than football and basketball. Donned in his U.S. Army Junior ROTC uniform, Sorrells was part of the color guard that stood before about 350 people at the start of Wednesday night’s education forum at Capital. He’s also part of the school’s show choir, the VIPs, other members of which performed the national anthem. After these ceremonial starts to the event, he stuck around to take part.